Make sure he often washes hands with warm water and soap to get rid of cold and flu bugs. Teach him not to touch his eyes or nose often as unwashed hands have thousands of germs that deposit on the mucous membranes that are rapidly absorbed into the bloodstream. 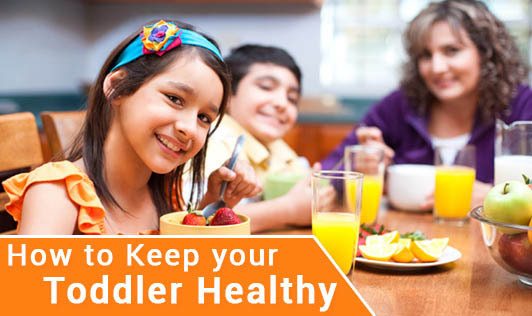 Make sure your kid's day care has a policy to keep the sick child away from the healthy ones to avoid infections. Make sure you consult with the Pediatrician and vaccinate him as and when required. A natural way to improve your child's immunity is by giving him a healthy diet and lots of physical activity along with proper sleep in the night. The best way to improve the fussy eating attitude of your child is by letting him decide the family's food. Though he is too young to decide the same, he wouldn't mind a trip to the super market. You can also improve his food habits by giving him a choice between two healthy foods and ask him to choose one every week and expose him to new foods gradually. Try growing fruits/vegetables in your garden terrace so that he will know how his food looks before it reaches his plate!